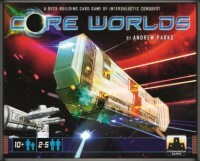 Core Worlds is a deck-building card game for 2 – 5 players. Each player controls a barbarian Star Empire represented by many cards. Throughout the game, players will invade Worlds and draft new Units and Tactics into their Empires. Each card lists its Empire Points in the upper right corner. The player whose Empire contains the most Empire Points at the end of the game is the winner! In Core Worlds, you assume the role of one of five different factions vying for control over the galaxy. To do this, you will play for 10 turns – each turn you will recruit new units, invade planets and just generally build a deck of cards for you to use in your quest to become the new leader of the galaxy. The premise behind the game is simple, and let’s be honest – we don’t play a deck builder for its story, most of the time. From a game play perspective, this is relatively standard game for deck builders go. You can recruit 1 card per turn from a shared central area, but you have a pre-set number of actions that you can take based on what part of the game you’re in. With that said, there are a number of different ways that the game is different from other deck builders. First off, you don’t discard your entire hand at the end of the turn. Instead, you are able to keep one card. This allows for some deeper and more complex strategies to come into effect. Another thing is that once you put a Unit into play from your hand, you won’t discard that unit until you go around and invade a planet. So, the game does offer a few different things than the other deck builders offer. Starting with what I like. The gameplay for this is really fun and addictive. I think that the idea of essentially having two different attacking values in its Fleet strength and its Ground Strength scores makes it really fun and diverse, and you need to essentially keep both fairly well balanced to be successful. I like how the game is presented into different stages, with more powerful units, tactics and more difficult locations as you go deeper and deeper into the game, which really makes the power level of the game get bigger and bigger. While not last, but the last I will list here, I love how simple the game is to learn and teach. It took me only a moment to learn the game and it took my wife just a couple of minutes actually playing the game to learn how its played too – the mechanics of the game are just very intuitive that you are able to hit the ground running pretty quickly and easily. Not a whole lot to say about bad points, but there are some. I think that the cards themselves are rather poor quality in its stock. The cards felt like poker cards to me, in all honesty. Which is a shame because the art and design of the cards is really impressive. I think that the card design is A LITTLE bit confusing at times, and I found myself getting the numbers wrong at times because I looked at a different spot. But I think the one part that I felt the game was lacking is that you really don’t attack the other player. Sure, you are able to mess with their gameplan a little bit – but you don’t attack the opponent, and for a game like this I feel that the game really would be better if it had some teeth. Ultimately, this is a fantastic deck builder and a good one to introduce somebody to this kind of game. Who would like it? If you enjoy a sci-fi theme, then its a great fit for you. If you like deck builders, then this would be a natural fit for you. Also if you want a light strategy game, this would be pretty good as well. Who would not like it? I think the game has enough to it to appeal to most audiences, but if you’re a power gamer then it may not be the best fit because you will probably end up playing the same way each game after a bit. I think that aggressive players, meaning the people who like to just eliminate others, may not like it for its lack of teeth as well. Other than that, I think most people may find something fun out of it, just to differing values. In Core World, you take on the role of barbarians on the outer reaches of a failing empire, who have decided the time is right to take over. You start out with a rather basic military, and march inwards to the core of the galaxy, recruiting stronger units, and conquering planets. It’s a deckbuilder, but it has some interesting things thrown in to make it a little more fun. First off, your starting hand is quite large, you have something like 20 cards. Your cards are a balanced mix of starfighters (fleet attack), infantry grunts (ground attack), a hero, and various tactic cards. you also have a player board, with energy and action indicators. The game also has a built in time limit. It only runs for 10 rounds, once the 10th round is over, points are added up, and the most successful conqueror wins the day. Every round, you start with a set number of actions, depending on the round number. Then you add up the energy production of your worlds, and that is how much energy you have for the round. A bunch of cards get dealt out from the different round decks (five of them) and those are the things available to purchase or conquer. Everything in the game takes action points and energy to do. If you have starfighters in your hand, and you wish to ready them for invasion, you spend an action per unit to place it in front of you, and then pay it’s energy cost. The unit then sits there in your “warzone” until you wish to use it. You may also draft cards from the center by spending an action, and the energy draft cost. Finally, having amassed a great army in your warzone, you may attack a planet in the center deck by spending an action, an energy, and whatever troops (fleet and ground) are required to defeat it, and take it for yourself. Planets require differing amounts of fleet and ground strength to defeat, so you must plan accordingly. Your new planet will generate more energy in future rounds, as well as give you victory points. The game executes the theme brilliantly. You are commanding an army, and running around conquering planets. As you progress through the rounds, you are moving closer to the center of the empire, and the units and planets are more powerful and heavily defended. When you finally hit the last two rounds, you are at the core of the galaxy, and the planets are worth a ton of victory points, and take massive amounts of army strength to defeat. The warzone concept is great. You can place your troops in front of you, and hold them there for multiple rounds until you are ready to use them. The depth of strategy is good. Attack planets early to generate lots of energy, or hold off for the larger ones later? Draft powerful stuff now, or spend energy deploying troops? There are many paths to victory here. The game comes with an additional first round draft deck, to spice up your starting deck a little bit. This optional feature really adds to the game. The theme is carried through perfectly. Deck thinning is built-in to the game. You can trash one unit used in an invasion when conquering a world. Additionally, cards in your warzone are obviously not in your deck, so they are temporarily thinned. The turns are performed in a rotation, so you don’t have much downtime while the other players choose their actions. Not a lot of player interaction. This could be good or bad. You don’t attack each other, or really do anything to hose one another. It’s a little more complex than your standard deckbuilder. It takes a bit longer to teach, as there is alot going on here. There is a little slowdown on the last two rounds as players calculate army power and energy costs to put up the power to grab the final worlds. The player boards are a little thin, and could have been made of better card stock, but they work. Overall, I find this game satisfies my itch for a deckbuilder, and a sci-fi game all at once. The mechanics are well thought out, and play is brisk (until the last round). The built-in time limit keeps the game from dragging out forever. There is alot of strategy and thought required to play well. I’m a big fan of this game. There is one expansion out for it, which I have not yet incorporated. Looking over the cards in the expansion though, it looks to add a lot of fun to the game, and modifies a few rules here and there to smooth it out. This game is a buy. This game plays well at any player count. With two players, the game scales wonderfully, and keeps all the intensity of higher player counts. I highly recommend this as a two-player game. I don’t like Dominion. For me the theme is bland and at the end of the game I’m left feeling underwhelmed. In terms of mechanics, I didn’t like the idea that the point of the game is to collect certain cards which give you victory points but those cards are essentially useless until scoring at the end of the game. Now most fans of Dominion will tell you that’s precisely the point and strategy of the game, but I found it frustrating and have generally stayed away from deck builders since. I love Core Worlds! Why? Well, like Dominion the goal of the game is to collect the most victory points, however, in my opinion, how you achieve that goal is much more engaging . In Core Worlds, the main way to get victory points is by invading planets, however once you’ve invaded a planet it then proceeds to give you more resources to continue in your galactic conquest (instead of gumming up your hand). Yet not all of the worlds are created equal and you often have to make the decision between one that will give you more resources and one that will give you more points at the end of the game. As far as hand management goes, I like the fact that you get to keep one card in your hand at the end of each round; it adds to the strategy and forward planning which makes this game so much fun. This ties into the ability to deploy your units in advance to conquer worlds in later rounds, which is a mechanic I particularly enjoy. Also, the units are very thematic and the abilities they you give tie in well with the unit description and artwork. All in all, Core Worlds succeeds for me where Dominion did not. It combines an immersive theme with interesting mechanics to make this an enjoyable and very replayable deck builder, even for those who might be dubious of deck builders to begin with. Core Worlds is an interesting deckbuilder. It’s not just deckbuilder, but combines more mechanics of pre-game draft, different factions, hand management, tableau building, energy and action points. The basis of the game is that your empire is invading the galaxy from the outer sectors towards the inner sectors that are older and more advanced. As players go from sector deck to sector deck, players will add to their deck with unit and tactic cards and build their empire with planets. The big points coming at the end of the game by capturing “Core Worlds” in the last sector. The player with the most empire points at the end of the game wins. Each player chooses one of the faction decks to start the game and go through a pre-game draft of cards from a special deck. The special deck contains units or tactic cards with special abilities and bonuses to enhance your starting deck. This makes your deck more customized compared to your fellow players. There are five sectors to the galaxy represented by five decks of cards, and each deck is played for two rounds before moving to the next. Players take turns drafting cards from a galactic sector deck which contains planets, units, and tactic cards. This costs action points and energy. Energy is provided by the planets you have in your tableau and some tactic cards. It should be noted that you never play all the way through a sector deck, so you can’t always count on a certain card showing up. This maximizes replayability. A player has to “invade” a planet with units that combine their fleet and ground strength that is equal to the planets strength. Once a planet is invaded, it is placed in a player’s tableau. With a successful invasion, a player can choose one of their basic infantry or starfighter cards to put under the invaded planet to help “cull” your deck of weaker cards. This is the only way in the game to remove less valuable cards. To “draft” a unit or tactic card from the sector decks, a player just pays the energy cost of the card and uses an action point. Drafted cards go to your discard pile waiting to be shuffled on the next round. To deploy a unit or tactic card, you pay a separate “deployment” cost in energy. At the end of the round players must discard down to at least one or none cards, then draw a fresh hand. Overall, Core worlds is a fun game to play. My beef with it is that there is very little player interaction, but I guess that’s par for deckbuilders. The limited number of rounds is nice, so that the game doesn’t drag out forever. Yet, it can drag out between turns if you have opponents prone to analysis paralysis on their turn. There can be quite a bit of reading to do with those cards. However, the game does feel like it ends quickly sometimes, because you feel like you’re just getting started by the time the Galactic Core worlds show up. That feeling sort of reminds me of Catan as well. There are a lot tough decisions the further the game goes, and you really have to make every turn count. This game probably isn’t well suited for social gamers, because there isn’t much interaction. It might be a little complicated for casual gamers and family gamers. Avid gamers should enjoy the mix of mechanics and strategic options. Strategic gamers won’t find any deep strategies, but there is strategy. Power gamers will probably want something more involved and more interactive or more expansions. It’s a solid game and worth a shot if you’re looking for a deckbuilder with a sci-fi theme. First a disclosure, I’m one of the play testers/developers of the game and a play tester/game developers for several other games by Andrew Parks (and Quixotic Games – http://quixoticgames.com). That said, I really enjoy Core Worlds. I really enjoyed Dominion so I was very excited to see what we could do with a deck building game. I love our addition of the tableau, as it removed (what I thought was) the worst part of Dominion, getting a great card when you couldn’t use it, because you can keep one card in your hand each turn. I also think the limited amounts of each specific card makes draft choices more strategic. Add a Review for "Core Worlds"